One of the first American maps to detail Singapore. 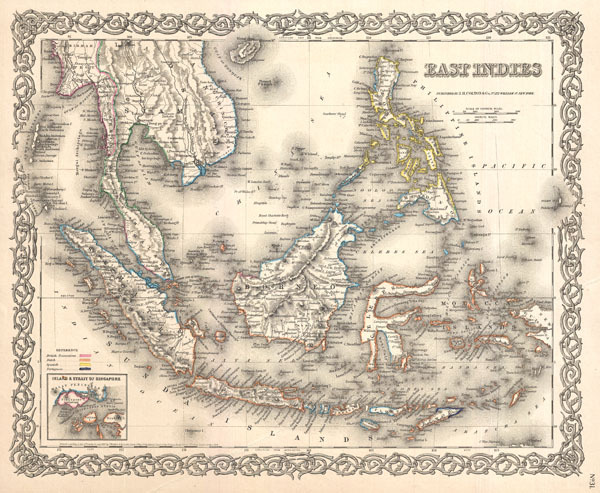 A beautiful 1855 first edition example of Colton's map of the East Indies. Covers from Burma in the extreme northwest to New Guinea and East Timor in the southeast. Includes of Burma, Pegu, Siam (Thailand), Cambodia, Chochin (South Vietnam), Malay (Malaysia), Borneo, the Philippines, Java Sumatra, and Singapore. This map is significant as it is among the first American maps to detail the Island and City of Singapore - appearing bottom right. When this map was made, Singapore, governed by the British East India Company, was experiencing a massive tide of immigration and growth due to its open immigration and free trade policies. Throughout the map, Colton identifies various cities, towns, forts, rivers, rapids, fords, and an assortment of additional topographical details. Surrounded by Colton's typical spiral motif border. Dated and copyrighted to J. H. Colton, 1855. Published from Colton's 172 William Street Office in New York City. Issued as page no. 31 in volume 2 of the first edition of George Washington Colton's 1855 Atlas of the World.